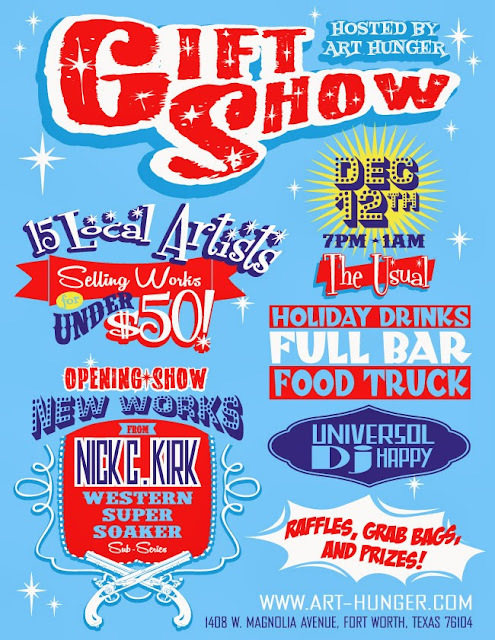 Gift Show in conjunction with the opening of Nick C. Kirk's new works at The Usual. Art-Hunger hosts: GIFT SHOW at The Usual in Fort Worth off Magnolia December 12th. 7pm-1am. Art under $50.00! Nick C. Kirk will have new work on exhibit, displaying pieces from a new sub series "Western Super Soaker." Art-Hunger will also be hosting a Gift Show selling work from fifteen local artists, all with price tags at a mere fifty dollars or less! There will be great holiday drinks at the full bar, live DJ's and a food truck will be in the back. This show is a must stop for any art collector or picking up some last minute one of a kind holiday gifts! There will be raffles, grab bags and other prizes at the event! More info will be added as it's available. has been changed to Friday December 13th! 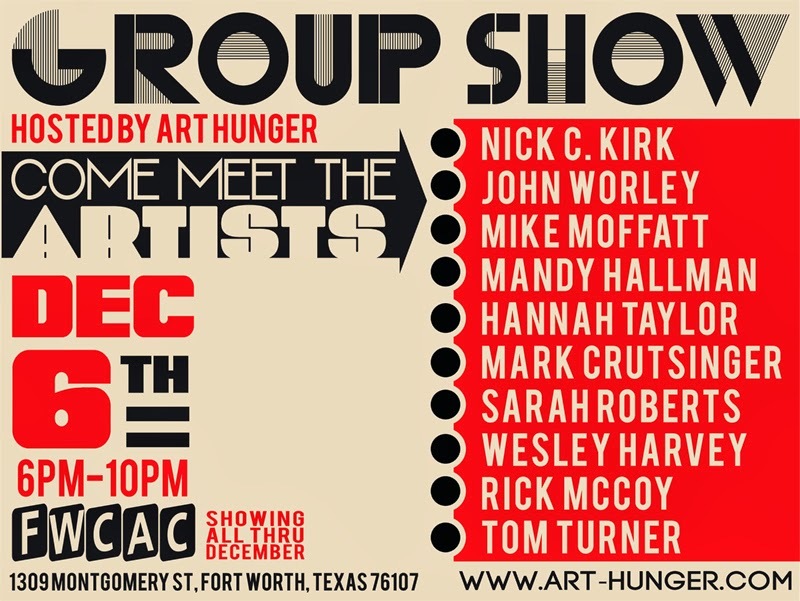 Swing by the Community Arts Center this Friday for the opening of Group Show, exhibiting works from Fort Worth and San Antonio artists: Nick C. Kirk, John Worley, Mike Moffatt, Mandy Hallman, Hannah Taylor, Rick McCoy, Mark Crutsinger, Sarah Roberts, Wesley Harvey, Tom Turner. The show will be up all month, but please come and meet the artists and enjoy the opening December 13th from 6-10pm. Art-Hunger hosts 2nd Annual North Texas Food Bank Benefit Art Show in Deep Ellum Dallas at Bizheard. 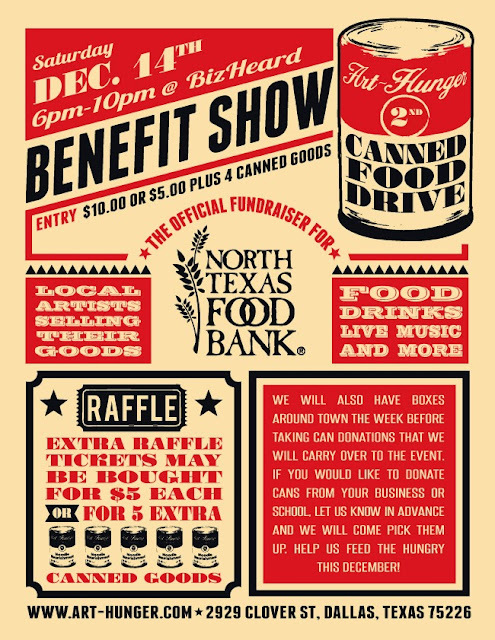 Art-Hunger will be hosting it's 2nd Canned Food Drive Benefit Show benefiting the North Texas Food Bank. This year the event will be held at Bizheard in Deep Ellum, Dallas, Texas On December 14th from 6pm-10pm. There will be local artists selling their goods, food and drinks, live music and more! Entry to the event will be 10.00 or 5.00 plus 4 canned goods. Entry will allow each patron an entrance wristband plus 1 raffle ticket. Extra raffle tickets may be bought for 5.00 each or for 5 extra canned goods. Raffles will include artwork by present exhibiting artists as well as gift cards and more! Each artist will have 4 feet of wall space(floor to ceiling) to display their work. All sales go through the artists. Limited space available. Check back here to find the signup registration link starting on Sunday the 24th at 11am. This is a first come first serve sign up. Last year was a huuuge success with over 400 pounds of canned food donated. We hope to have an equally successful event this year! We will also have boxes around town the week before taking can donations that we will carry over to the event. If you would like to donate cans from your business or school, let us know in advance and we will come pick them up. Help us feed the hungry this December! KutThroat DJ's will be spinning music.